Our Lent study this year was led by Rev. Sue Bond and took the form of a study of five very different paintings of the crucifixion. Sue invited us to study the pictures and use them to aid us in prayer as well as discuss what they meant to us, and how they resonated with our own internal images of the crucifixion. We also considered what words from scripture, psalms or hymns came to mind when we studied the images. We focussed on the last words of Christ from the cross each week and how they resonated with the image. Spend some moments just looking at the image, what draws you to it? What do you first focus on when you look at it and then where do you look? Is there anything you like about the picture? If you don’t like the image what is challenging and how might God be provoking you? Does the picture remind you of any words from scripture, or hymns, prayers, or any words / actions of the liturgy? Are you prompted to praise God, to confess something, to thank him or to make a request? Do you see Christ’s love for you in this image? Is there something you want to say to Christ? Is there something Christ wants to say to you? Ask God to allow you to know more of him as you contemplate this image. Week 1 Sir Stanley Spencer, 1934. The words "Father, Forgive them, for they know not what they do." ​Stanley Spencer was born in Cookham in Berkshire and spent most of his life there. 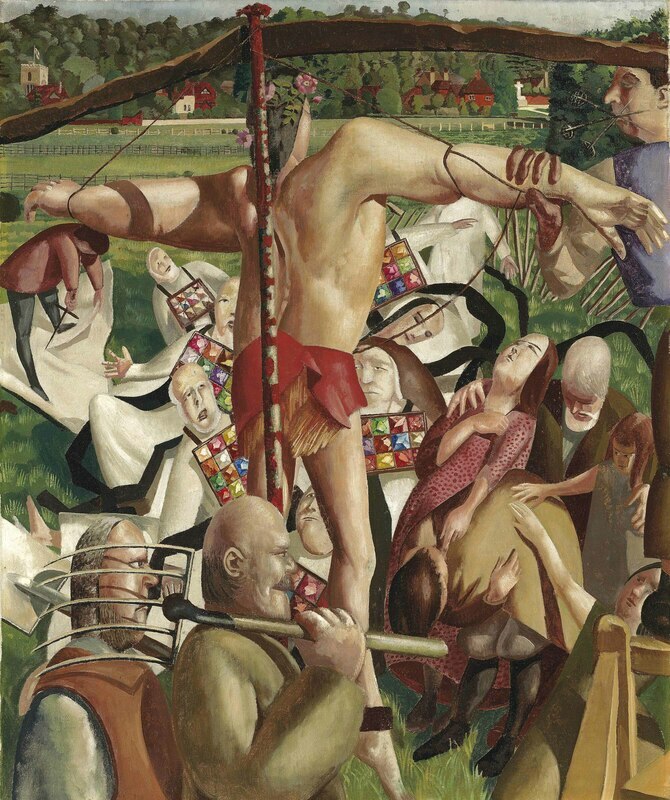 Cookham therefore appears as the backdrop to many of his paintings including this one Crucifixion 1934 the second of three portrayals of crucifixion he completed. In it he alludes to a previous painting Scarecrow, Cookham (1934) and the figure of the scarecrow is transposed directly into the figure of Christ. There are details in the background village of Cookham in the 1930s with its church tower and a cross in the distance presumably upon the village chapel, which refer to the crucifixion event in the foreground. There are three groups of characters in the foreground. There are priest-like figures wearing tabards which distinguish the twelve tribes of Israel. There are family and friends who are clearly dismayed at what is happening. There is a group of workmen who, absorbed in practical activities such as cutting up a cloth or going off digging, seem oblivious to the crucifixion in their midst. We cannot venerate this image of crucifixion as we might were it a conventional portrayal. Although this is a picture of the crucifixion within it are echoes of Fra Angelico’s Jesus appearing to Mary Magdalene. For example, The same shades of cream and pale green are used and the pink of the roses in Jesus’ hair is like Mary’s dress. The composition has parallels too with the line of trees in the background and the separation between foreground and background marked by a fence of paling. Jesus’ is crucified on an insubstantial cross, and his crown bears flowers not thorns, yet these do not ease but rather heighten our sense of indignity and scandal. By portraying someone strong giving himself up crucifixion Spencer provokes us to ask how can this happen to One who is both human and divine? Week 2, Francis Newton Souza. The words "Today you will be with me in paradise." ​Although Francis Souza was born in Goa in India he worked in Britain from 1949 and received critical acclaim as one of a group of artists from countries formerly within the British Empire whose innovative style of work was appreciated as contributing a new approach to particular subjects. Although using the expressionist style, this painting is representational rather than abstract. The viewer is close up to the depiction of crucifixion. This painting is one of several religious pictures by Souza, who wanted to reject what he described as the 'blond operatic Christs’ that he had been encouraged to admire at the Jesuit school he attended in Bombay. 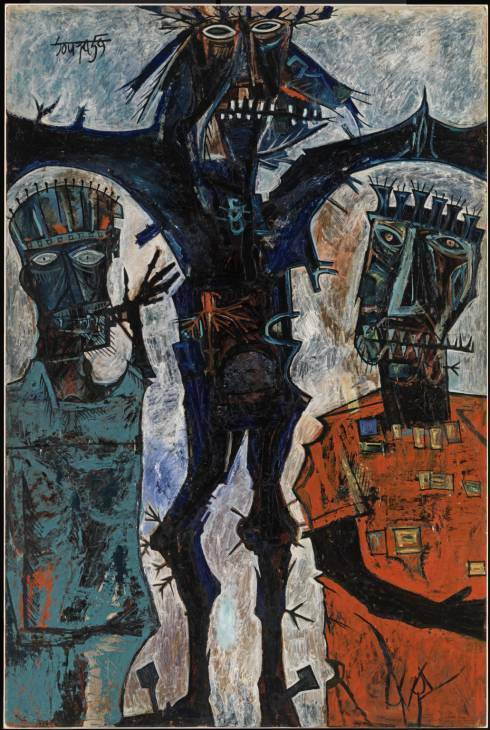 Instead, Souza says this painting emulates, 'the impaled image of a Man supposed to be the Son of God, scourged and dripping, with matted hair tangled in plaited thorns' which had seen hanging over the altars of the Catholic churches he attended for worship. There are three figures in the painting. All have distorted mask-like faces, with jagged edges and thorn-like marks on or around their bodies. The central figure is Christ with outstretched arms and a bleeding gash in his body. The figures on either side of Jesus may be the criminals crucified with him although their apparently standing posture of suggests they are observers of the crucifixion. They wear coloured tabards and distinctive headgear. The hideous ugliness of crucifixion is made clear in this picture suggested by a sinister violence in the characters besides Jesus and the distortion of Jesus’ body. There are huge nails in Jesus’ feet. The thorns coming out of his body look as if in some way he had been assumed by the wood of the cross. It is a striking and scandalous image. The agony inflicted upon God in Christ is unavoidable in this portrayal of crucifixion. Week 3, William Roberts. The words "Woman, behold your son.."
​In the First World War William Roberts served as a gunner on the Western Front, and at just 23 years old in 1918 he became an official war artist. Most of his religious art was painted after the Second World War. This Crucifixion in oil, completed in the 1923, is a busy mass of shapes predominantly in reds, oranges and blues. It is a very crowded image with interlocking sharp shapes depicting the context of the crucifixion. The harsh crowd is full of movement and action. The form of the picture with its angular shapes of the collected mass of figures describe a chaotic context. Unlike most images of crucifixion those being crucified, although predominant are not central to the picture. Why might Roberts have chosen to place them on one side? The people are so closely packed together that one is not immediately able to distinguish between the three people being crucified. We can identify which character is Jesus because Mary his mother and the disciple John are pictured at the foot of his cross. This figure of Christ which is very muscular and strong may not necessarily fit with our own idea of the Christ figure, especially if we have in mind more familiar images of crucifixion where Jesus body is thin and bloodied from his treatment before being nailed there. In this image there’s no blood pouring from his wounds, there are no signs of the scourging and he is not wearing a crown of thorns. This depiction shows the disordered and rushed business of crucifixion. For some people watching it appears to be a some carnival spectacle watched by people who have no compassion or feelings for those being crucified. There is only sympathy for Jesus from Mary his mother and his disciple who know and love him. Observing the detail of this picture one is not surprised that men are crucified. Roberts portrays the crowd’s eagerness to observe crucifixion suggesting a salacious thirst for witnessing violence whilst some simply stand by callously. In this way it presents a world in need of redemption and places the crucified Christ in the midst of it. Week 4, Graham Sutherland. The words "My, God, my God, why have you forsaken me?" and "I thirst." ​This painting is displayed in St Matthew’s Church Northampton and is said to be Sutherland’s finest religious work. The figure of Christ in his crucifixion beneath magnificent tapestry of Christ in Glory in Coventry Cathedral, placed behind the altar, looks just like this figure of Christ. The background of this Crucifixion is a stark, cold, blue wall which seems to be made of panels. The crucifixion appears to be happening indoors. The figure of Christ is grey, its shadowy curves contrast with the geometric blocks of the background. The arms and claw shaped hands of Jesus stretching across the beam of the cross are big and strong, the upper part of the body is contorted and his face is screwed up with pain. The lower half of the figure is diminished by contrast and his legs are thin and bowed. There is blood pouring from his wounds. Sutherland worked as a war artist during the second world war and some of his agonised imagery reflects that experience. In particular, photographs he had received of concentration camps had a profound effect upon him; the tortured bodies reminded him of figures deposed from crosses. The catalogue notes from the Image of Christ exhibition in St. Matthew’s, Northampton, 1993, suggest that the bricks behind Jesus’ feet connect him to civilisation and that little railing - like an altar rail - stresses the sacredness of the event but still associates the spectator with it. The same notes suggest that Sutherland wanted to convey the majesty and dignity of Christ’s crucifixion. 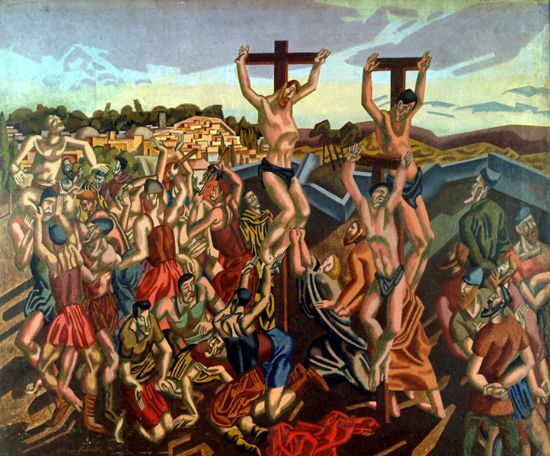 This painting with its clear reference to concentration camp victims illustrates Christ entering into the experience of human suffering at crucifixion. The strong arms stretched out wide and the bleeding hands suggest the offering of Christ’s blood at the Eucharist. However the anguish on the face of Jesus and the distortion of his body is a stark reminder of the scandalous suffering endured by God in Christ to secure this offering. Week 5, Craigie Aitchison. The words "It is finished." and "Father, into thy hands I commend my spirit." 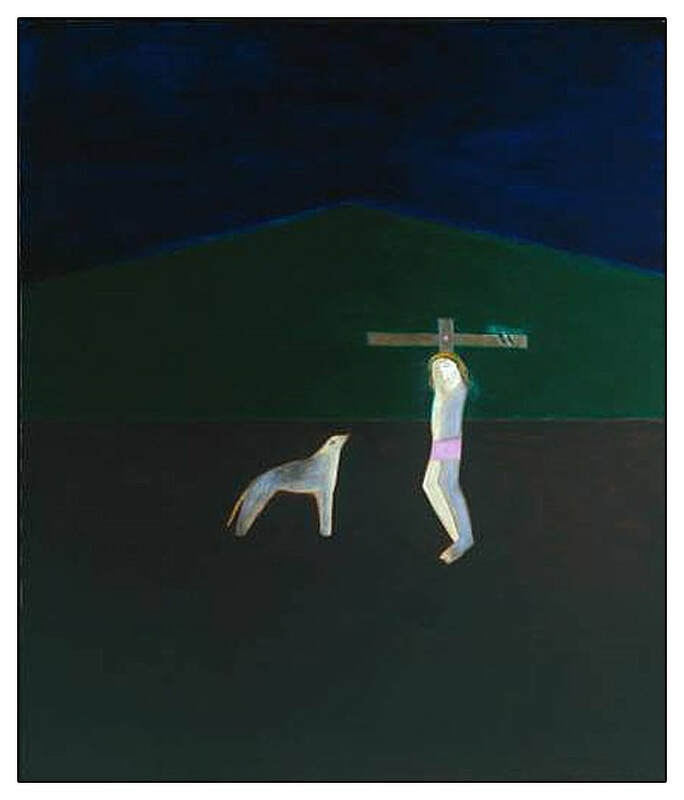 Craigie Aitchison was Scottish painter who is exhibited throughout Great Britain. In 1955 Aitchison won a British Council scholarship to visit Italy. This visit had a profound effect as he saw Gothic and Renaissance paintings in situ. He especially admired the art of Piero Della Francesca. 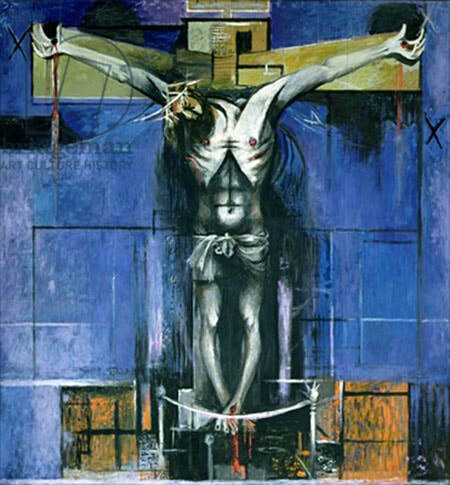 It is said that some of his paintings, especially of the crucifixion in the early 1960s are influenced by Italian art. He often chose religious subjects, especially the crucifixion. Technically Aitchison has an original, economic style that defies conformity. This painting of the crucifixion in oil on canvas is one of a series of minimalist depictions of the crucifixion completed by the artist. It is a small painting 30 x 25cm [or 12” x10.”] There are no distractions from the subject of the crucified Christ in any of his paintings of crucifixion. The Tate Gallery catalogue introducing Crucifixion 9 says: “This painting depicts the crucified Christ on the cross in a dark landscape. Christ wears a pink loincloth; his arms are not represented. Two black birds with orange beaks sit on the left arm of the cross, while on the other side a standing white dog looks up at the Christ figure. The background is divided into three broad bands of colour: brownish-black for the earth, green for the simply-denoted triangular hill and dark blue for the sky. “[Craigie Aitchison] has identified the [distant] hill as Goat Fell, on the Isle of Arran, which dominated the view from his childhood holiday haunt, Lamlash.” Aitchison often uses Goat Fell in his paintings, especially as a setting for crucifixions and landscapes. It symbolises childhood happiness for him and nearby Lamlash is the place where his parents' ashes were scattered. The background comprises large, dark, geometrical blocks of colour. In the foreground the crucified Christ is pictured without arms and it is unclear how he is fixed to the cross. A lone animal observes the crucifixion. Both characters give off light in an otherwise very dark image. The dog pictured here is a Bedlington terrier, which Aitchison frequently uses in his art. He simply loved Bedlington terriers and always kept them as pets. Perhaps Aitchison is alluding to the sacrificial imagery of the paschal lamb in this lamb-shaped dog. It is a tender, spare portrayal of the subject of crucifixion. Its studied simplicity serves to make the focus clear. The starkness of the treatment of crucifixion in Aitchison’s depictions does not make direct reference to Bible verses or doctrine. Nevertheless it may bring to our minds and hearts verses of the Scriptures and express what we understand to be the nature of God. The leaning figure of Christ is very fragile but there is no attempt to manipulate the emotions of the observer. Christ’s isolation in crucifixion and the frailty of his human nature are depicted in this picture. It not a picture of hopelessness because the power of divine light is present despite the world’s darkness.